ICAR-Central Citrus Research Institute (CCIR) invites job application. 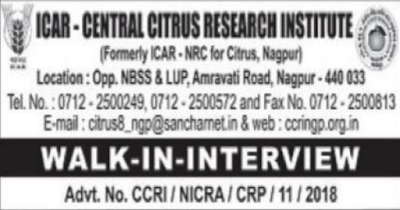 This jobs is for the Senior Research Fellow (SRF) Posts. Candidate from the Nagpur will apply for this job. The Official Website is www.ccringp.org.in This is a great chance for interested candidates. Post Name: Senior Research Fellow (SRF). Ph.D. in Agricultural Entomology or M.Sc. in Agricultural Pass for more details Please Check Official job link provided below.